Campaigners claim former Longbridge workers will be “absolutely shattered” by the High Court’s rejection of a legal bid to claw back over £12 million for redundant employees. Long-time Longbridge campaigner Gemma Cartwright, chair of the Rover Community Action Trust, said the High Court ruling, revealed on birminghampost.net yesterday, would devastate many ex-workers who had pinned their hopes on four-figure payouts for more than seven years. Ms Cartwright, who was awarded an MBE for her work for former MG Rover staff, said: “People have put their lives on hold believing that this money was going to come. They will be absolutely shattered. “We get asked all the time; when we go shopping in Northfield, people say: ‘Are you still fighting for that Trust Fund money? Do you know when the Fund is coming?’ You can see the pain that people are going through. “Seven years on, it is simply not fair to keep people hanging on. Enough is enough – it can’t carry on like this. “There’s still hardship in the Longbridge area. 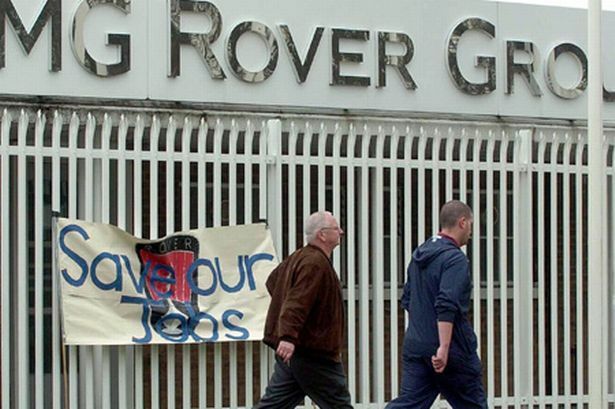 We know of former Rover workers who have been made redundant two, three times, even more. The High Court has refused an application by lawyers for Phoenix Venture Holdings seeking to prove banking giant HBOS should not have withdrawn more than £12 million pledged to redundant car workers. Lawyers for PVH had argued for the disclosure of financial information relating to the disposal of 8,000 cars by HBOS which could have helped raise funds for ex-workers. PVH has vowed to carry on the legal battle but the next step remains unclear. But Ms Cartwright said campaigners would now press for a share of a separate £23 million fund raised following the liquidation of MGR Capital, MG Rover’s finance and lease loan book, which was ring-fenced by Longbridge directors and not part of the PVH assets pledge.